I feel as though I have gone from being “the hare” of fable, into more of a “tortoise” pace. The year 2014 ended in a mad dash to make my species list a nice, even 130 birds, and I had a great deal of fun doing it. The new year of 2015 has started slowly, with only a couple of iPhone images snapped and my first time participating in a Christmas Bird Count. It’s quite the change. The last two weeks of the year, I went almost no where without my camera and binoculars. (Okay, in part that is because it’s just so much fun to look at things from far away with the binocs.) This got me my green heron on a lunch break at work, among several other fun images. I have some pictures left I’d like to share so that I can feel I’ve fully wrapped up 2014. I spent a lot of time watching out my living room window, as my yard is my favorite “patch” (an area a birder or bird watcher visits regularly). There are a lot of common visitors, birds who even recognize me when I go out to fill the feeders and which have grown tolerant of my presence. Particularly if I have a bag of seed. 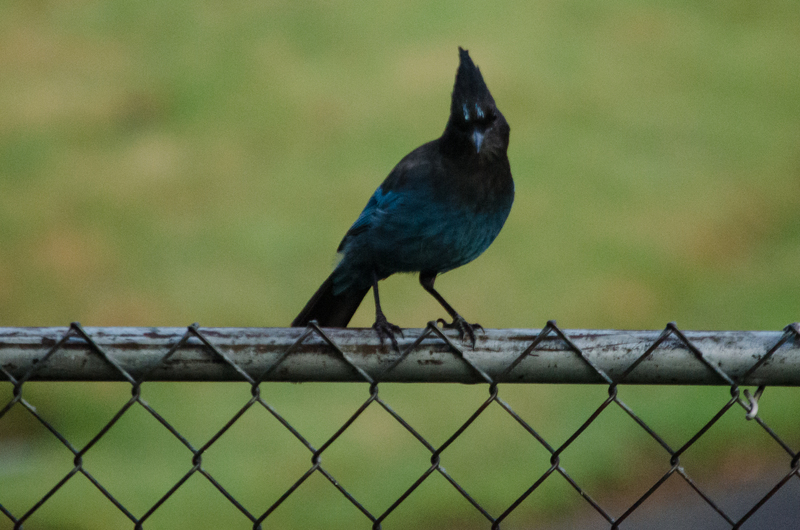 The Steller’s jays and western scrub jays are always hopeful for peanuts. I can put out a stack of peanuts – still in the shell – and they will vanish within minutes. It’s a lot of fun to watch them squabble over their goodies. When the peanuts are gone, they will check out the other feeders but they really don’t take too terribly much. The squirrels also like the peanuts, but unlike the jays they will without hesitation raid every other feeder in the yard. I try to be zen with this, so long as they are not dumping the trays onto the ground. Besides, they are just so darn cute when they aren’t being destructive. Most of my other frequent flyers are much smaller than the jays and squirrels. 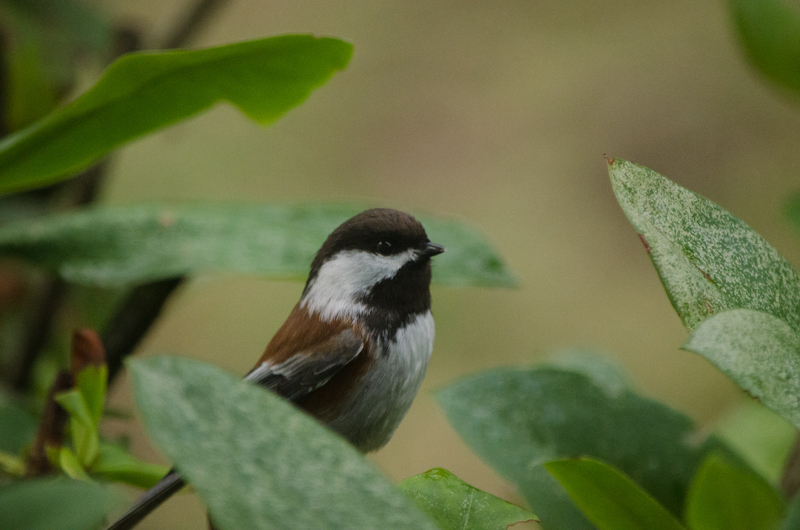 During the winter, chestnut-backed chickadees are reliable pretty much any hour of every day. These little guys often take the largest nuts they can fit their beak around, then fly a few feet away to peck it apart. 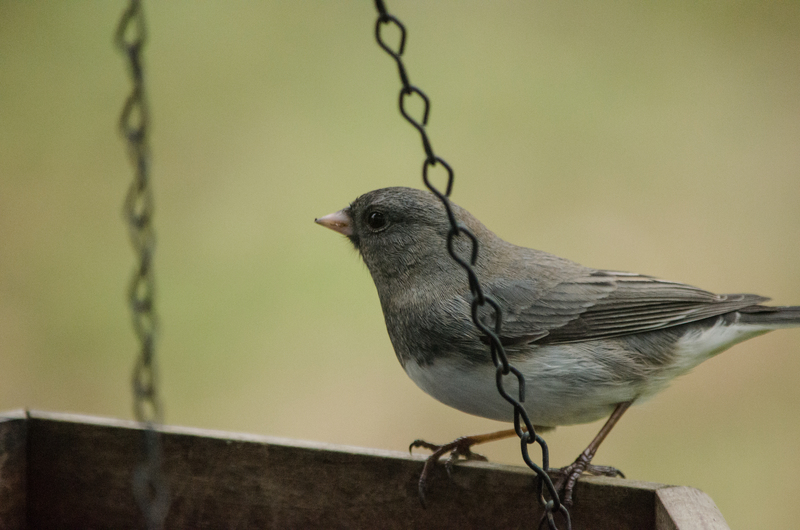 Small flocks of juncos visit regularly, and although they will land in or on the feeders and up in the dogwood tree, they seem to much prefer searching the ground and under the bushes for a snack. 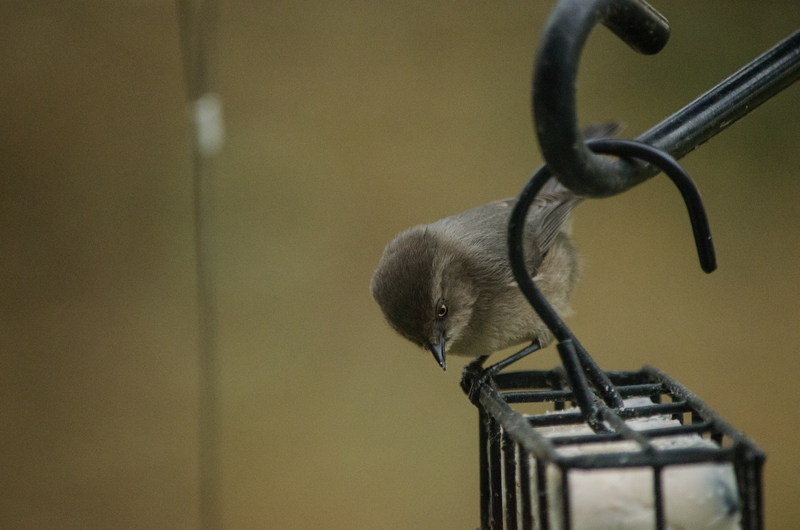 Bushtits arrive in greater and greater numbers all the time. I’ve seen groups over about forty at a time show up in my yard! They swarm the suet feeders. More commonly, the flocks are in about the twenty-bird range. Red-breasted nuthatches were regulars all last year but had disappeared from my yard over the summer. They’ve only recently returned and I’m glad to see these little guys back. They don’t stick around for long, snagging a nut from a feeder and flying off almost immediately with it, but they do many trips per day. I have had a couple of less-common visitors with the onset of winter. 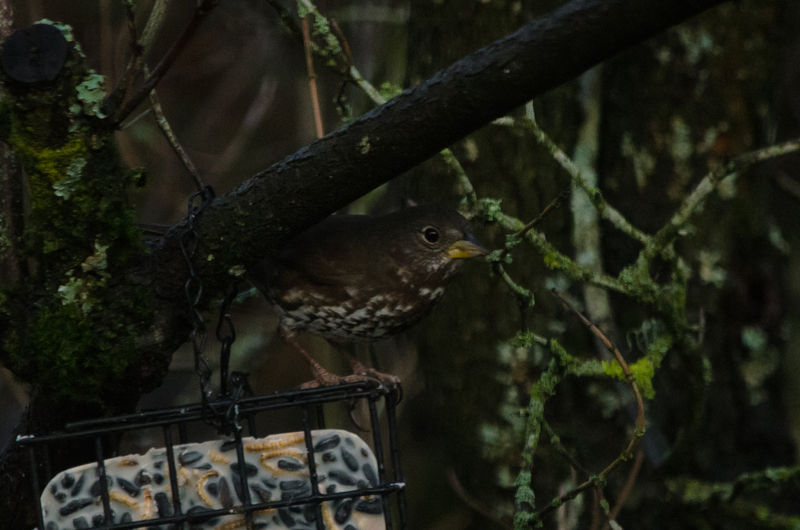 Although at a glance it can be mistaken for a song sparrow, I was pleased to realize this was actually a fox sparrow visiting my suet. 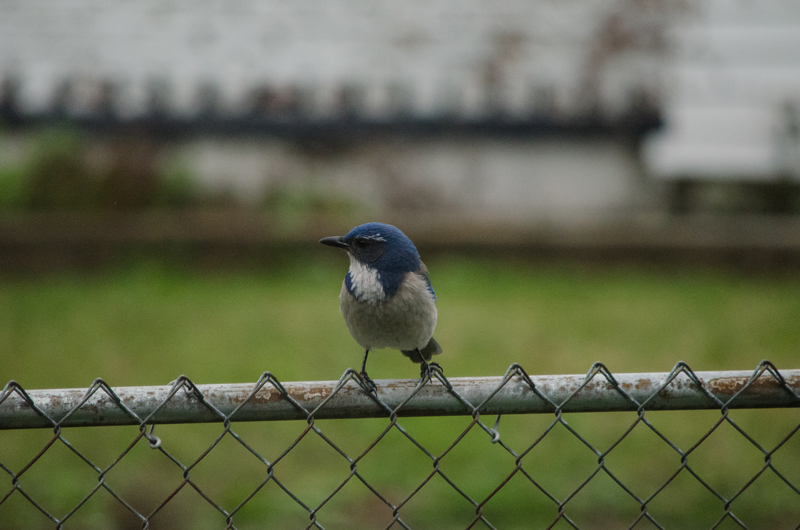 He’s been back several times, and often keeps under the nearby azalea. 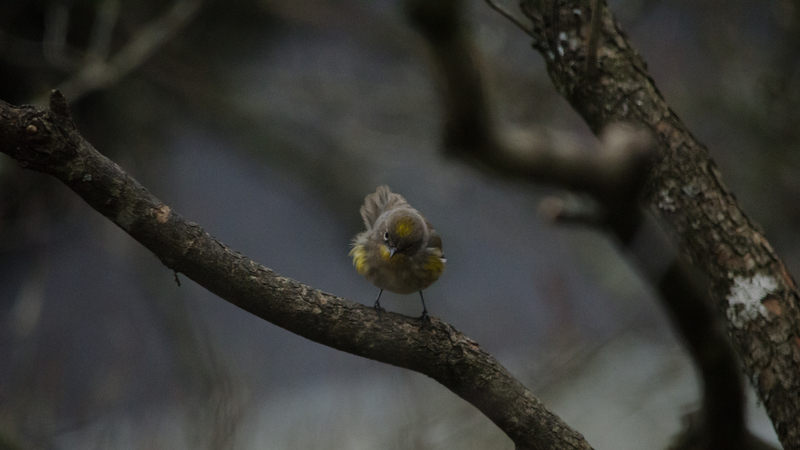 I’ve also had a regularly-returning yellow-rumped warbler. I see these all year round when out exploring, but they are not common feeder visitors. Especially this time of year, the warm little spots of yellow really stand out. 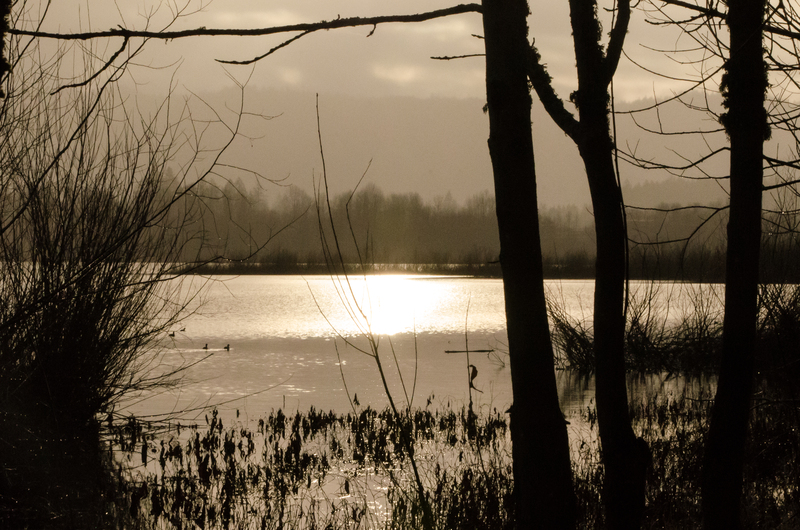 One of my last outings for the year was over to Smith & Bybee Lakes Wetlands. Although the weather was not very cooperative, I did still get a few pictures that made it worth the trip. It was overcast and threatening rain when I arrived, and eventually the weather made good on that threat. I made it to one of the covered blinds and hunkered down for a bit, watching some coots swim by as the sun broke through. 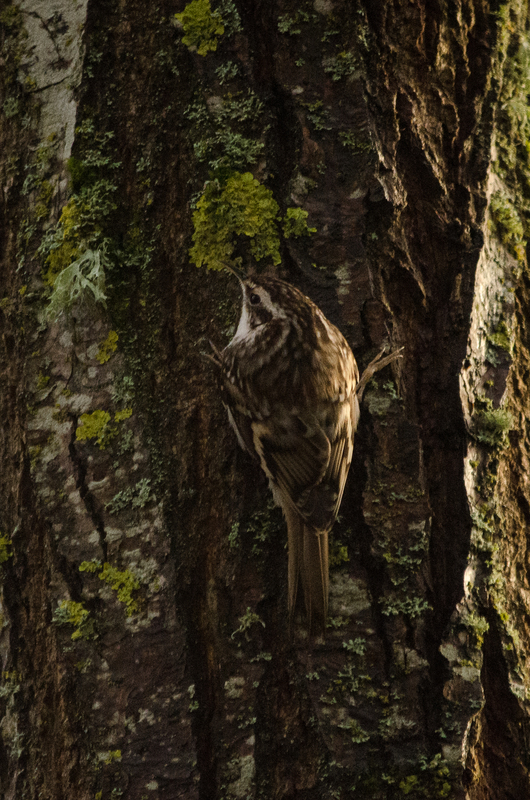 Not long after, the rain let up and four brown creepers flew over to land just a few feet away. 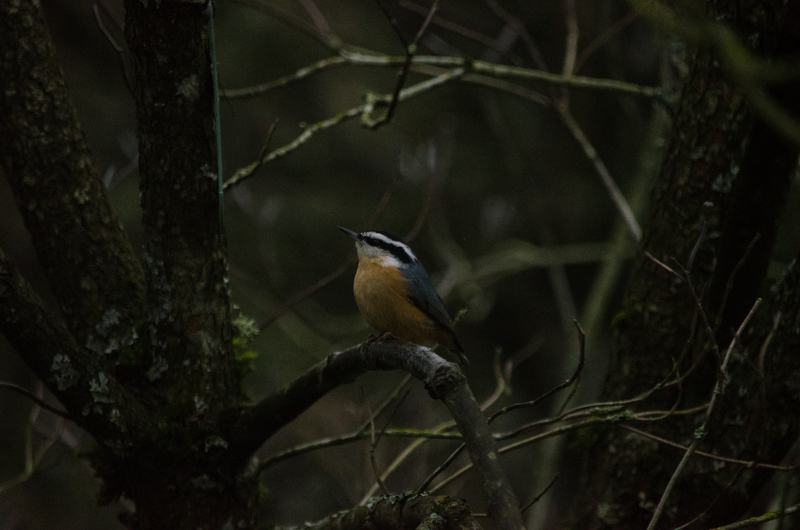 These are normally shy, solitary birds and so this was really neat to see. The one closest to me definitely gave me a good look, but seemed to have decided I was no threat. They were mostly back-lit, which gave me an added challenge in capturing this picture. 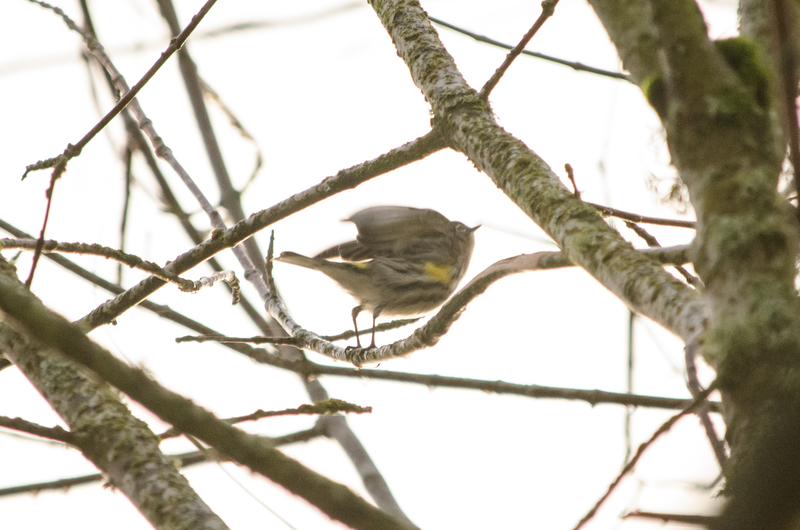 A yellow-rumped warbler was with them, although far less cooperative as a subject for my lens as he bounced from branch to branch. Watching the sun set over the water, I knew this was my last little outing for the year. I had my first Christmas Bird Count coming up, after all, and what better way to kick off a new year of birding! I’m excited for what lies ahead. After all, there are still countless places left to explore with my camera and I will have a new list to build. For more images from my birding year, be sure to visit my Flickr site. Comments are always welcome! Thank you for the kind words, Bob. I took a peek at what you did with the photo (here for anyone else who wants to see: http://pacificnorthwesttravelerdotcom.wordpress.com/2015/01/05/helping-a-photo/) and boy did you brighten it up! 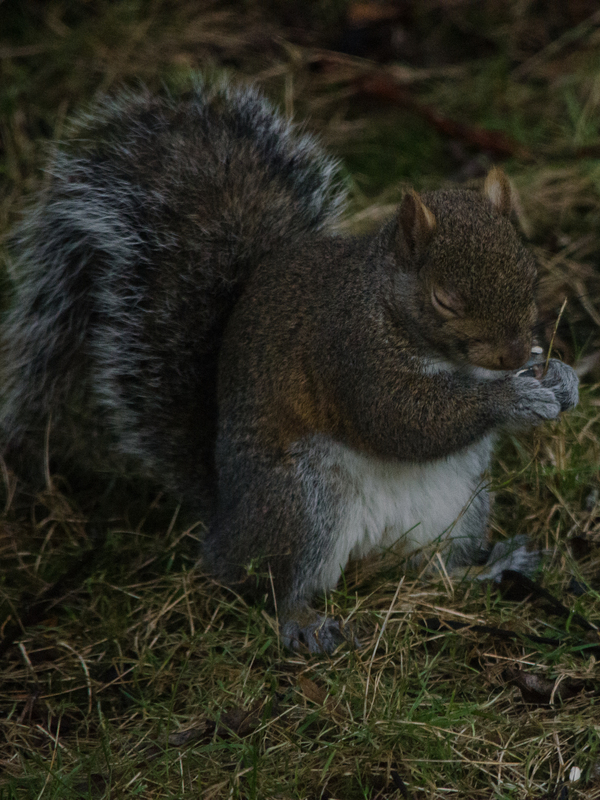 I will say I did not do much post-processing, and I don’t even usually post the squirrels here, but that one just looked so cute that I had to throw it into the mix. I’m still pretty new in the photo-editing world, so if you have any tips or tricks, I’m always open to constructive feedback. 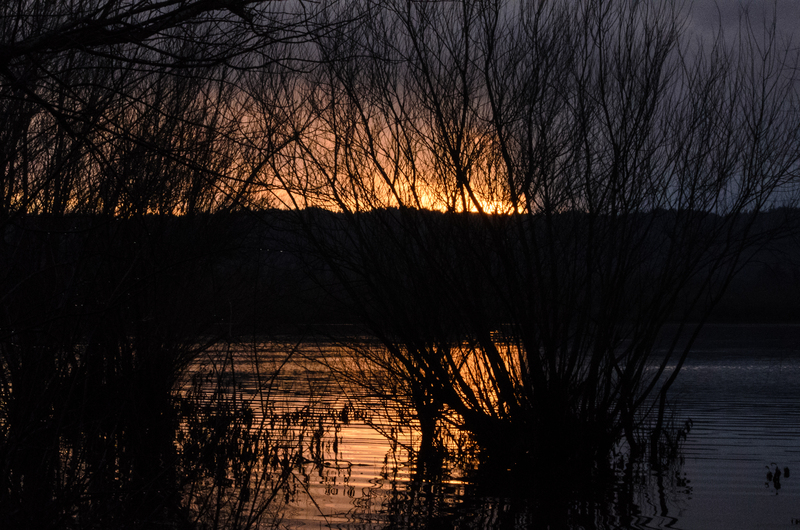 I’m currently in love with using Lightroom; I do have Photoshop as well, but haven’t delved into using it as a photo editor (I have used it for basic graphics creation). Nothing wrong with Lightroom. I have the lastest version as well. I’m one of those folks who rent it all for $10 a month. Ditto. I’m very happy with it so far, I’ve only been using it for a few months. I’ve been using Elements and Photoshop for 20 years so I never use Lightroom. I teach Photography and editing for free to anyone who is willing to learn. It takes time and effort. If someone is too busy to learn I never bring the subject up again. Everyone has their priorities in life.. all I can do is offer my time and knowledge for free. Cat, beautiful photos! Love them all!